This interesting surname is of Anglo-Saxon origin, and is locational from Hanscombe End in Shillington, Bedfordshire, and means "Han's valley". The placename is derived from the medieval German given name "Hans", and the Olde English pre 7th Century "cumb", valley; "Hans" is an aphetic form of Johannes (John), which is itself from the Hebrew "Yochanan", meaning "Jehovah has favoured (me with a son)", or "may Jehovah favour (this child)". Locational surnames, such as this, were usually acquired by a local landowner, or by the lord of the manor, and especially by those former inhabitants of a place who had moved to another area, usually in search of work, and were thereafter best identified by the name of their birthplace. 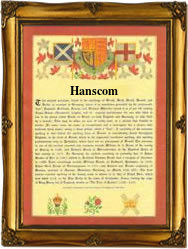 In the modern idiom the surname can be found recorded as Hanscombe, Hanscomb, Handscomb, Hanscom and Hanscome. Recordings from Bedfordshire Church Registers include: the marriage of Joan Hanscom and John Marram on February 2nd 1636, at St. Mary's, Luton, and the marriage of Elizabeth Hanscom and Thomas Hanscom on September 8th 1703, at Ampthill. The first recorded spelling of the family name is shown to be that of Alan de Hanscombe, which was dated 1255, in the "Chartularies of the Abbey of Ramsey", Bedfordshire, during the reign of King Henry 111, known as "The Frenchman", 1216 - 1272. Surnames became necessary when governments introduced personal taxation. In England this was known as Poll Tax. Throughout the centuries, surnames in every country have continued to "develop" often leading to astonishing variants of the original spelling.